Home » What is Bio-Clean? 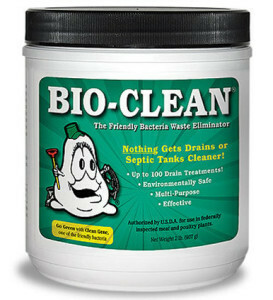 BIO-CLEAN is… a blend of bacteria and enzymes. The bacteria are natural, not genetically-engineered. The enzyme concentration is the most powerful on the market. It’s safe, it’s effective and it can be used to handle most any clogged drain that you have. Take a look at the video below for more information on how Bio-Clean can help you. Bio-Clean is non-poisonous. It doesn’t create any heat or fumes, and there’s no boiling. It does not attack live tissue nor inorganic materials, only organic wastes like grease, hair, food particles, paper, cotton & sewage. This makes BIO-CLEAN safe for people, plumbing and the environment. BIO-CLEAN changes the waste particles into water, carbon dioxide and mineral ash which run harmlessly out of your waste system. These elements are then available for plant life. Eliminates costly compensation to employees that have been injured by using dangerous chemicals.